Ok..So we are nearly there! Our credencials are nearly full with sellos and your Camino family are looking to book flights home. But before we do anything else, there is the small matter of talking about towns beginning with “P”….and there’s a few!! We start with possibly the largest town on the Camino, other than Santiago herself. When someone mentions San Fermin, “the running of the bulls”, Hemingway and “The Sun Also Rises”, you automatically think of Pamplona (or Iruña in it’s favoured Basque). Situated in Navarre, it is home to close to 200,000 people. The city is also famous for its “pinchos” and it’s always worthwhile to spend some time in the historic quarter where you can sample them (www.spain.info). Just make sure you call them “pinchos” and not “tapas” like in the rest of Spain! As you make your way into Pamplona, you will pass a number of suburbs – Villava and Burlada – and finally see the town’s fortress walls. You are now entering the old town. Leaving the following day, however, is another issue, as I discovered in 2014 when I was geographically embarassed 🙂 The yellow arrows don’t tend to be distinct. There are many albergues, hostels and hotels to choose from here (Gronze). I really enjoyed my stay in the municipal albergue. 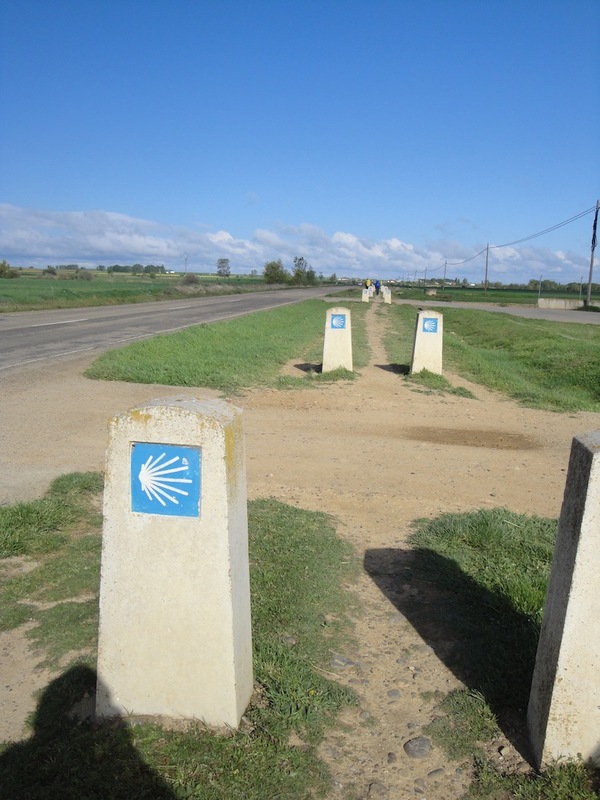 It is also well worth a visit if you are not walking the Camino. Staying in Navarre and only a further 25 km westward, we find Puente la Reina, or the Queen’s Bridge in English. The town was named as such as the bridge was built by Queen Doña Mayor, the wife of King Sancho III, to facilitate passage of pilgrims over the river Arga. It is a town heavily influenced by the Way to Santiago, with the remains of walls and several religious buildings in place. El Iglesia de Santiago was founded by the Knights Templars, who settled in there. Also worth mentioning are its large medieval bridge of five arches, and the church of San Pedro, from the 14th century. There are a number of places for the weary pilgrim to rest their head in Puente la Reina (Gronze); Albergue Jakue being one of the better ones. Close to 300km further on down the Camino Frances, we reach Población de Campos. Calling Población de Campos a town would be a push however, as nearly 200 live here. Hamlet would be the appropriate word! It is situated in Castilla y Leon and is the next town to Fromista. In the village, you will find Church of the Magdalena; and the chapels of Socorro and San Miguel. I do remember stopping here for a cafe con leche in 2015, but I haven’t considered it as a stop off point. There are a number of albergues here however (Gronze). The following video shows you scenes of the town. A further 100 km along the way, we arrive at Puente Villarente, a suburb of Leon. Named after it’s large Romanesque bridge, it has a population of approx. 150 people. I have passed through here on two occasions and wish I had stayed here as it is a long slog into the city of Leon. A footbridge was built recently for pilgrims to avoid any accidents on the busy main road. There are a number of albergues here also (Gronze); San Pelayo is getting good reviews. Ponferrada is the capital of the El Bierzo region and is one of the major points of the Camino Frances. The historic quarter of this town sits below an imposing castle built by the Knights Templar.The Castle rises above the river Sil, dominating the city’s historic quarter. Construction began on this medieval fortress towards the end of the 12th century. It is also worth visiting the Museum of El Bierzo, located in Calle del Reloj, in the building which was the former prison. Its facilities provide an introduction to the history of Ponferrada. As with every large town, there are many places to stay (Gronze). I haven’t stayed here myself, preferring to stop in the town prior, Molinaseca. Another small village located just outside a larger town. Pieros has a population of less than 50 people and is dependant on the Camino. Five kms along the way is the much larger Villafranca del Bierzo, in the Bierzo valley. Pieros is home to the fantastic Albergue El Serbal y Luna and don’t forget to take a pit stop at the Café Bar Arroyo (on the left hand side of the road) before moving on. Pereje is the first town you arrive at on leaving Villafranca del Bierzo; 5 km to be precise. However, it is worth noting that you will only see this town if you walk along the roadside. There are two alternative routes (via Dragonte and via Pradela) which skip a number of towns, but that’s for another day. Pereje is built just off the busy N-V1 motorway and also lies on the River Valcarce. I walked through Pereje on my way to O Cebreiro in 2012 and even though it was a tough day, Pereje is one of those towns that make you want to come back to Spain, open an albergue and give back. There is a great albergue and a pension to choose from here (Gronze). Leaving Pereje, you return to the N-V1 with Santiago on your mind. I have 3 more towns from Galicia to talk about in my next post.